Creech Air Force Base is the headquarters of the USAF’s 432nd Air Wing of Predator and Reaper drones which operates armed remotely piloted aircraft in various foreign countries. 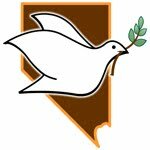 The NNSS continues to support the country’s nuclear weapons programs, has a mandate to restart full-scale nuclear bomb tests within two years if so ordered by the President,and receives and stores radioactive waste on land that legally belongs to the Western Shoshone Nation. “We are at an important milestone with 10 years of occupation in Afghanistan (and 8 in Iraq), expending millions of our tax dollars on unmanned aerial vehicles which are responsible for thousands of civilian deaths. The wars have bankrupted our country. It’s time to stop the deadly drone strikes,” states Nancy Mancias, CODEPINK Ground the Drones campaigner. protests can be found here. A picture (courtesy Stop Nuclear Power Network) from the anti-Nuclear Camp at Sizewell, Suffolk, England, 22-25 April 2011. The campaign to get the US to stop carrying out drone attacks in tribal areas would continue till its “logical conclusion”, Imran Khan, chief of the Pakistan Tehrik-i-Insaf (PTI), said here on Saturday. He said that international law guaranteed the sovereignty of all independent states, but the US and its cronies in Pakistan had violated the law by killing scores of innocent people.He said the sit-in organised by his party would bring to an end the US designs for the region. Bangor Five and "a time of war"
The five are accused of using bolt cutters Nov. 2 to breach three chain-link fences surrounding the so-called Main Limited Area of the base, which is home to part of the Pacific nuclear submarine fleet. That area is patrolled by armed guards, who confronted the invaders at gunpoint, according to a news release from the U.S. Attorney’s Office. Durkan said the group — dubbed the “Bangor 5” in the news release — entered the naval base “during a time of war” and went into an area clearly marked as off-limits. Kelly and another Jesuit were arrested for a Nov. 19, 2006, demonstration at Fort Huachuca near Sierra Vista, Ariz., where they claimed military-intelligence officials taught the torture techniques seen at Abu Ghraib. A federal grand jury finally handed down a litany of indictments against five nuclear resisters who entered the U.S. Navy’s West Coast nuclear weapons storage depot in a plowshares action on November 2, 2009. On September 3, 2010 the United States Attorney announced the indictments handed down by a grand jury in Tacoma, Washington, against members of Disarm Now Plowshares came ten months after their plowshares action in which they entered Naval Base Kitsap-Bangor in the early morning hours of November 2, 2009, All Souls Day, with the intention of calling attention to the illegality and immorality of the existence of the Trident weapons system. 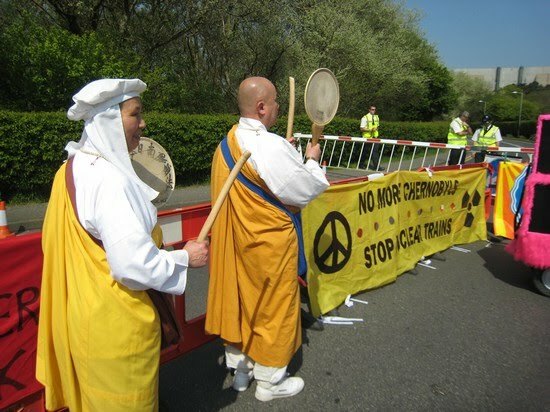 During the action they held a banner saying…“Disarm Now Plowshares : Trident: Illegal + Immoral”, left a trail of blood, hammered on the roadway and fences around Strategic Weapons Facility – Pacific (SWFPAC) and scattered sunflower seeds throughout the base. They gained entry to the secure nuclear weapons storage facility known as Strategic Weapons Facility-Pacific (SWFPAC) where they were detained, and after extensive questioning by base security, FBI and Naval Criminal Investigative Service (NCIS), cited for trespass and destruction of government property, given ban and bar letters and released. 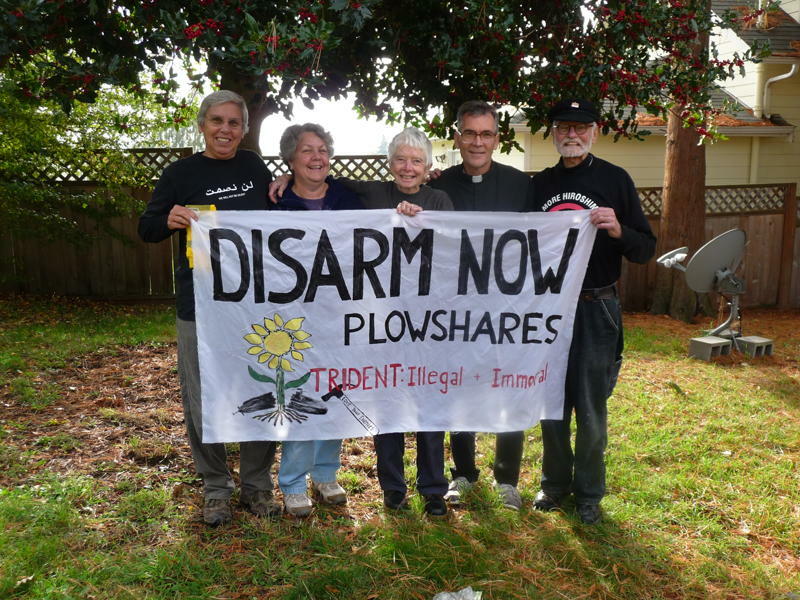 Following a 10-month wait, the Disarm Now Plowshares defendants are ready to face trial in the Western District of Washington stemming from their Nov. 2, 2009 disarmament action. In the months since her action, Greenwald, a retired community health nurse and social worker, and mother of three grown children, has welcomed her first grandchild into the world. Knowing that Jack has been born into a nuclear-armed world has given her more of a sense of urgency “to wake people up” to the imperative of nuclear disarmament, and “to expose what we choose to avoid,” Greenwald said. Moving to Kitsap County in 1983 to join the Ground Zero Center for Nonviolent Action Greenwald participated in several nonviolent actions at the Trident Base and is currently on probation for “crossing the blue line” August 2009. She currently lives in Tacoma and works with the Tacoma Catholic Worker. Thirty years ago this month, Montgomery was involved in what was the first of more than 100 Plowshare disarmament actions when she was among a group of eight people who hammered on components of a Mark 12A nuclear missile at General Electric’s King of Prussia, PA weapons plant. Funding for war and the nuclear arms race is coming at the expense of programs for the poor, Kelly said. “We’re going to crumble from within.” As he faces trial once again, and the prospect of another long federal prison sentence, Kelly said he remains hopeful that humans will turn away from war and nuclear weapons. “It gives me tremendous hope to live for what I may not be able to see achieved in my lifetime,” he said. The Disarm Now Plowshares defendants will appear in U.S. District Court in Tacoma for arraignment on September 24, 2010, at 1:30 p.m. The Trident submarine base at Bangor, just 20 miles west of Seattle, is home to the largest single stockpile of nuclear warheads in the U.S. arsenal, housing more than 2000 nuclear warheads. In November 2006, the Natural Resources Defense Council declared that the 2,364 nuclear warheads at Bangor are approximately 24 percent of the entire U.S. arsenal. The Bangor base houses more nuclear warheads than China, France, Israel, India, North Korea and Pakistan combined. The base has been rebuilt for the deployment of the larger and more accurate Trident D-5 missile system. Each of the 24 D-5 missiles on a Trident submarine is capable of carrying eight of the larger 455 kiloton W-88 warheads (each warhead is about 30 times the explosive force as the Hiroshima bomb) and costs approximately $60 million. The D-5 missile can also be armed with the 100 kiloton W-76 warhead. The Trident fleet at Bangor deploys both the 455 kiloton W-88 warhead and the 100 kiloton W-76 warhead. Visit http://disarmnowplowshares.wordpress.com for complete information, including biographical statements and links to the work of the Disarm Now Plowshares. See attached group photo of the Disarm Now Plowshares members. From left to right, they are Susan Crane, Lynne Greenwald, Anne Montgomery, Steve Kelly and Bill “Bix” Bichsel. WASHINGTON D.C. – Cindy Sheehan, preparing to protest the US drones that kill civilians, has already shaken up the security patrol at General Atomics in DC. Before she left home, the General Atomics “landlord” called her, concerned about the protest tomorrow, Thursday, July 8. After she arrived in DC, she was watched by General Atomics security. Also, Sheehan’s wallet was stolen and someone attempted to run up a $911.00 bill for merchandise at Target. Backing up a bit, General Atomics is the maker of the Predator B drone that crashed near the US/Mexico border at Nogales, Arizona, in April of 2006. Fortunately, no one was under the 10,000 pound drone when it hit the ground. The official cause was lax controls and pilot error. The drones along the US/Mexico border were grounded for a while, until the US Grim Reapers and profiteers convinced Congress and Homeland Security that what the border needs now is more of the out-of-control, crashing drones. On the US/Mexico border, there’s $500 million available for drones and most will go for the General Atomics MQ-9 Reaper, also known as Predator B. The drones killing civilians in Iraq, Afghanistan and Pakistan are remote computer controlled by Airforce soldiers seated in their easy chairs in Nevada and Arizona. Today, Sheehan described being questioned by General Atomics security. There’s a scene right out of a paperback spy novel. The General Atomic security guard saunters past her in another part of town, on the Metro Station platform, trying to look nonchalant in a ball cap and backpack, a formula look for leading a secret life. Not so funny is the fact that killing is big business in the United States. Listed below are just a few of the recent drone contracts. There are too many to list, including those along the US/Canadian border, where dangerous drones are being used to stimulate the economy. Besides the construction of drones, millions of dollars in contracts are being awarded for the training of remote control drone pilots. In May, General Atomics received a $195 million contract to build 34 Sky Warriors drones for the US Army. Boeing is also profiteering from the drone business with a new contract. Boeing is well known along the Arizona border for wasting millions on spy towers that don’t work. Boeing also desecrated the graves of the ancestors of the Tohono O’odham during construction of the border wall. In May, Northrop Grumman was awarded $620.8 million in contracts for Global Hawk UAV and signals intelligence UAV payloads.